Chart-topping band Busted have announced they are to split up. The decision comes just days after band member Charlie Simpson said he was temporarily parting company with bandmates James Bourne and Matt Willis. "It's a really sad day for all of us, but we've always said that if one member left then we'd call it a day," Willis told Busted's official website. "This has been a really difficult decision and I hope the fans will understand," added Simpson. "We're not going to carry on because Busted needs to be remembered the way Busted was - not two of us carrying it on," said the band's James Bourne at a press conference in central London. "We're sorry the fans had to find out through the papers. We wanted to tell them ourselves," he added. Simpson, 19, said he wanted to "set the record straight" after speculation about the group's future. He added he wanted to quash rumours about not getting on with his bandmates, saying: "I've had the most amazing three years." Bourne, 21, said he was "devastated" about Simpson's departure, to concentrate on his other musical project, a band called Fightstar. The act have been playing together for a year. Busted's split comes a day after Fightstar added 13 dates to a UK tour. Bourne and 21-year-old Willis have said they also plan to carry on their careers in the music industry, while the band are not ruling out the prospect of a reunion. "Never say never. If we're all skint with seven kids when we're 25, then maybe," said Willis. 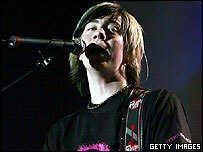 He also voiced his thanks for the support Busted have received from their fans in the past few years. They have said there are no plans for a farewell single, but they would like to do something special to thank their supporters. Busted fan Lynda White, 16, travelled from Reading, Berkshire, to witness their farewell, and said she simply wanted to "say goodbye and get a reality check". But fellow fan Kate Mills, 18, from Wolverhampton, said she would not be following Simpson's new musical venture. "It would have been better if he'd announced what he was doing at the end of the last tour and got on with it,"she said. 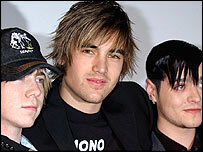 Busted first hit the charts in September 2002 and have since scored eight top ten hits, including four number ones. Their last chart-topper Thunderbirds won the Record of the Year award. 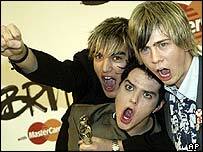 The trio had a successful 2004, winning the Brit Award for best breakthrough act as well as a nomination for best group. The band's reputation as a live act has also been strong, seeing them fill arenas on a regular basis.